Does your idea of the perfect summer vacation include a cozy cabin in the woods, complemented by the perfect lake for lazing by or playing in, all surrounded by towering trees and majestic mountains? If that fits your bill, don’t wait to book a stay in one of the cabins at Lake George Escape or Alpine Lake, both located in New York’s incomparable Adirondack region. 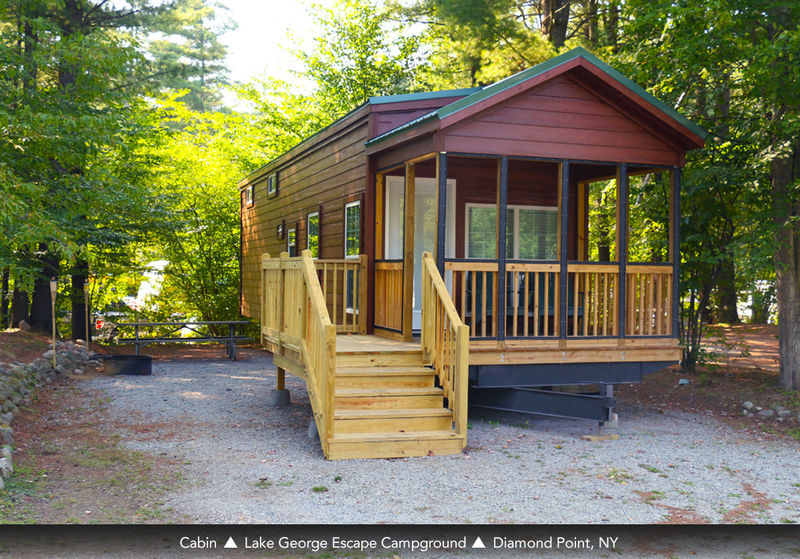 Lake George Escape, located in Diamond Point, sits on 178 acres and has direct access to the Schroon River. With four cabins to choose from (one sleeps 4, one sleeps 5 and two sleep 6), this is the place to enjoy an idyllic summer getaway. Amenities vary from cabin to cabin but all promise to be the perfect place to spend your summer at the lake. The campground also has two pools, a playground and of course access to the lake. 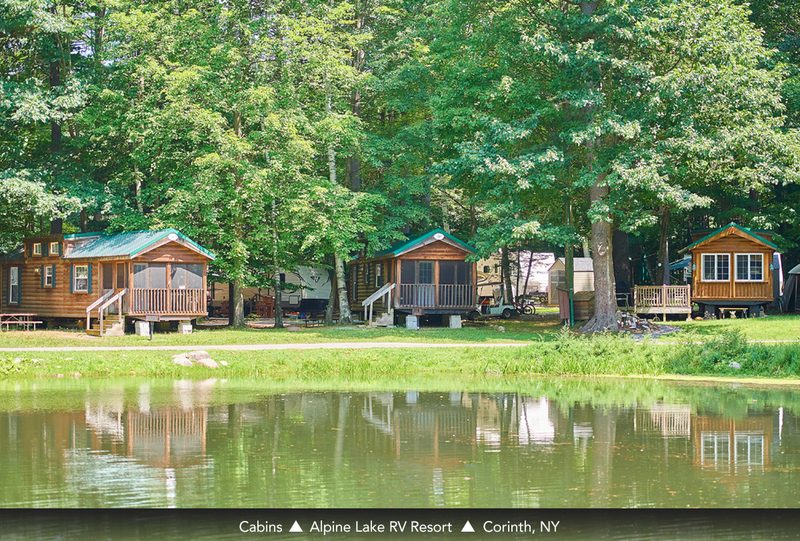 The cabins at Alpine Lake RV Campground, located in Corinth, sleep 6 and have full bathrooms and kitchens complete with refrigerator, stove, microwave, as well as AC and heat. The resort has fishing available in the stocked lock and plenty of hiking and biking trails to explore. Nearby to both campgrounds, there is plenty to keep you busy this summer. While there are certainly “inside” things to see and do, the focus here is enjoying the outdoors. There are hiking trails, rafting and tubing trips, scenic boat rides and lots of fishing. From a history buff’s perspective, there’s Grant Cottage State Historic Site, in Wilton, where Ulysses S. Grant spent the last days of his life writing his memories and where for years Civil War veterans trekked to pay homage to our 18th president and Civil War General. Another top historic attraction is Lake George Battlefield Park, a 35-acre park that preserves battle sites from both the French & Indian War and the Revolutionary War. Both the Saratoga Performing Arts Center (SPAC) and the Adirondack Theater Festival (AFT) have a lot to offer this summer season. The AFT, located in Glen Falls, produces a nine-week summer theater schedule and this summer’s shows include Alice in Wonderland, Calling All Kates, a romantic musical comedy and The Enlightenment of Percival Von Schmootz, a musical comedy billed as Monty Python meets the Dark Ages. Check out this summer’s lineup at www.atfestival.org. SPAC runs the gamut of entertainment genres from live big-name concerts including the Dave Matthews Band and Dead and Company to opera, ballet, and theater productions. A full calendar of events can be found at www.spac.org. Special events to note include the Adirondack Wine & Food Festival, June 29-30, at the Charles R. Wood Festival Commons in Lake George, that will showcase 120 wine vendors, craft beverages, artisan foods, food trucks, and vendors. For information on that event, visit www.adkwinefest.com. Come fall, when the color show of autumn makes its debut here, the Adirondack Balloon Festival draws more than 150,000 people to this event to watch the hot air balloons soar into the mountain skies. That event is set for September 19-22 in Queensbury. Pick your events, pack your bags and book your cabin for a tranquil, yet cultured, lazy, yet, sporty and definitely all kinds of fun summer in the Adirondacks. Go to www.PetiteRetreats.com.